The Westworld teaser trailer aired Sunday night just before Game of Thrones and it is everything you wanted. 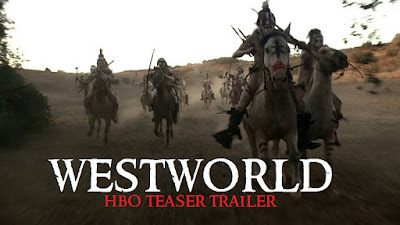 Westworld, created by Jonathan Nolan and Lisa Joy with J.J. Abrams in tow as executive producer, is a series-length remake of the original 1973 sci-fi thriller. Featuring an all-star cast including Anthony Hopkins, Evan Rachel Wood, Tessa Thompson, and Ed Harris, the series, like its predecessor, will explore artificial intelligence and the dark side of human nature. The series has been in development since 2013, and promises to be both chilling and provocative. Crichton’s original film focused on what happens when androids at an adult-themed amusement park revolt after a malfunction. The reboot shifts the focus to the androids, who are used to fulfill the dark fantasies of the human visitors. Westworld premiers this coming October on HBO.